George H.W. Bush celebrated his 90th birthday on June 12 by making a tandem parachute jump near his summer home in coastal Maine. The US’s 41st president made the jump delivering on a vow he made five years ago even though he can no longer use his legs. 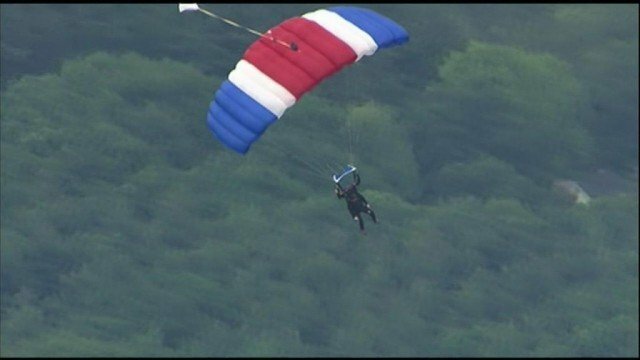 The former president jumped from a helicopter at 6,000 feet harnessed to Sgt. 1st Class Mike Elliott, a retired member of the Golden Knights, the Army’s parachute team, near Kennebunkport. Mike Elliott guided George H.W. Bush to a gentle landing five years ago. On Thursday morning, the helicopter picked up George H.W. Bush outside his home, known as Walker’s Point. His family transported him from his wheelchair to the chopper, then sang “Happy Birthday” before it took off. George H.W. Bush could later be seen floating to the ground using a red, white and blue parachute. He landed safely near St. Ann’s Church, where friends and family had gathered, according to a spokesman, out of the sight of reporters. “He had a big smile for the crowd. You could tell he was exhilarated,” said Diana Untermeyer, a family friend from Houson. The jump was kept secret partly to give George H.W. Bush himself the option of bagging it. Spokesman Jim McGrath said the former president likes both a surprise and an adrenaline rush. “It’s vintage George Bush,” Jim McGrath said. The first time George H.W. Bush jumped from an airplane was when his plane was shot down in World War II over the Pacific. Later, he decided to jump from a plane of his own accord and marked his 75th, 80th and 85th birthdays by skydiving. The former president said on his 85th birthday that he’d like to do it again on his 90th. Other birthday festivities included a private dinner with more than 200 relatives and friends, including some from his White House days: press secretary Marlin Fitzwater, White House counsel Boyden Gray and political director Ron Kaufman, Jim McGrath said. His children, including former President George W. Bush and former Florida Gov. Jeb Bush, will be there, Jim McGrath said. George H.W. Bush now uses a wheelchair or scooter because of a form of parkinsonism that has robbed him of use of his legs.